12 Mistakes Advertising Agencies Make When Pitching & Presenting - Peter Levitan & Co. Here are my 12 favorite advertising agency pitching and presentation mistakes. Delivered as a ‘must do’s’ cartoon poster. I’ve purposely served the pitching mistakes up as advice, as things to do. Why? Because as you will see throughout my paperback and eBook, The Levitan Pitch. (especially in the interview section) many advertising agencies, pitch leaders, and team members, make these crazy mistakes. According to the 18 agency search consultants interviewed in the book, these pitch mistakes are made all the time. Agencies make them despite knowing that they will lower the their batting average. This is quite baffling. The agency hasn’t worked at being distinctive. There might even be a fear of being “too” different. Strange, but true. The agency hasn’t done a good job of planing the flow of the presentation. They haven’t approached the pitch as theater. Agencies often leave their best presenters behind because it is someone else’s’ turn to go to the pitch. Huh!? The agency presents way too many strategic and creative ideas. The speed at which agencies start to work as soon as they are invited to pith an account. Rarely do they stop and think through the entire process before all hell breaks loose. Most agencies do not have a clear methodology for how they are going to run pitches. It is almost as if they are starting with a blank page every time they are invited to pitch for new business. I recommend a few things to do to manage the pitch including having a standard agency checklist. You can see one in my Pitch Playbook. Worse, most agencies don’t even have a master business development plan. 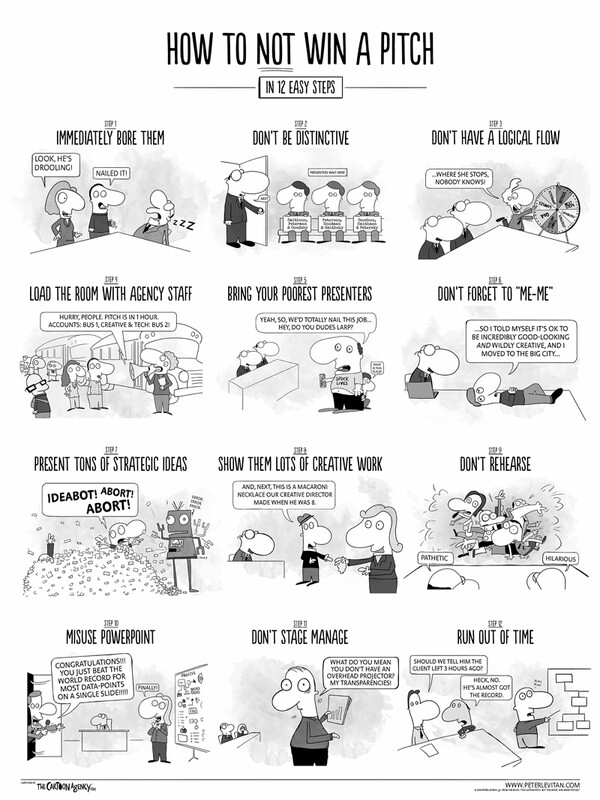 To help resolve this dilemma, I offer my 12 deadliest mistakes as counter- intuitive must dos illustrated by series of cartoons from my friend Steve Klinetobe and his company The Cartoon Agency. Yes, you can buy the poster. According to David Ogilvy, this poster will help you win more new accounts, have a happier staff, add more vacation days for all (OK, maybe management) and it will get a few laughs that, I think, will be good for your pitch batting average. Get it up at your agency. It is for sale at Society6. This entry was posted in eBook, New Business, Pitching and tagged ad agency, new business, Pitching. Bookmark the permalink. Trackbacks are closed, but you can post a comment.